I have taught a wide range of subjects related to art and design for 16 years, to a broad age group of learners. The experience I have gained has taught me to be adaptable to different learner’s needs. Before I became a full time Lecturer at Preston’s College, I taught at different Schools and Colleges, which gave me an insight to how different education establishments operate and highlighted how important it is to be flexible at all times and adaptable to change in order to move forward and improve the learning experience. I am also known as a Textile artist and exhibit my work whenever possible which helps to keep my teaching up to date and motivating for the learners. I have written short creative courses and managed a team as a Programme Team Leader for Creative and Digital Arts. I am a great believer in encouraging and motivating the learners to feel good about their achievements and one of the projects I put in place was to create a fashion/art show for the learners so that they can become motivated, and enthusiastic about showcasing their talent, which encourages independence and confidence, I did this for 7 very successful years. I feel very passionately about giving something back to the community and making a difference where ever possible. I have worked with a lot of different people throughout my years of teaching and as an artist. Working with people of all ages and backgrounds is the best part of my job, one of my strengths is having good interpersonal skills when working with different people. Some of them have learning difficulties, or are hard of hearing or partially sighted, and some are fun or challenging or difficult. It is so rewarding to see someone either turn their life around or enjoy taking part in activities that improve their quality of life and give them pleasure. As the Programme team leader for the Art department at Preston’s College I managed equipment and materials required, I managed the budget for the fashion/Art show, and organised press releases for the show and other arts projects that I ran in the College. Some of these included working on the AquaDucked project and Crown Paints in Preston and Darwin, working with an Asian woman and children’s group in Manchester to make creative costumes and put on a fashion show. I am always keen to undertake new training, to learn new skills which I can pass on to others, and for my personal achievement. working with young people to make garments inspired by the Museum to be displayed in an exhibition in December 2018. 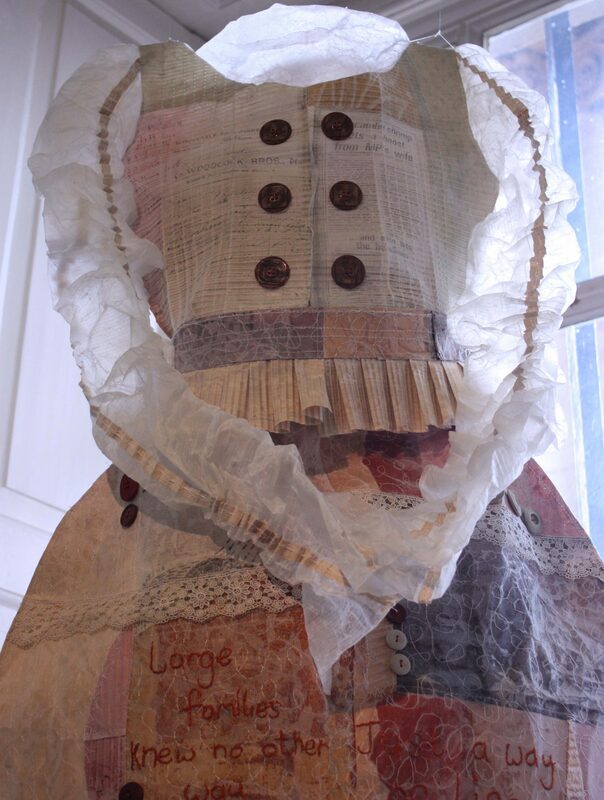 My Textile Art work is about social history, I enjoy working with people and learning about the stories they have to tell which are fascinating and I want to share this with others through exhibiting my work.